Ghazipur figures prominently in Amitav Ghosh’s Sea of Poppies, the first novel of his Ibis trilogy. Set in the 1830s, it presents Ghazipur as a centre of large-scale opium production, and narrates the travails of characters like Deeti, who has to suffer an afeem-addicted husband and a life that goes nowhere. More than a century later, in 1962, Congress leader Vishwanath Singh Gahmari left Pandit Nehru and parliament in tears when he spoke of people in eastern Uttar Pradesh being so poor that they fed on grains gleaned from cowdung. Ghazipur has since changed, and though the region still remains distressed, change is being pushed. Prime minister Narendra Modi had referred to Gahmari’s speech while addressing a rally in Ghazipur on November 14, 2016. “I have come here deliberately on November 14 [a reference to Nehru’s birthday] to expose those who haven’t worked towards fulfilling what Pandit Nehru committed to doing for the region,” he said. Gahmari had wanted a bridge constructed across the Ganga so Ghazipur and eastern UP could be connected to markets in Howrah and Delhi. An opium factory in Ghazipur, perhaps the biggest legal one in the world, supplies a vital ingredient of painkillers to the pharma industry. But the region has still remained neglected. More than 55 years after Gahmari’s speech, the land of poppies is witnessing a sea change and the change is palpable. After decades of stagnation and neglect the development initiatives that are underway in Ghazipur are making news. Things are changing and are moving at a pace that hints at a mission that seeks to compensate years of neglect. And the man in charge of this ‘mission of change’ is Manoj Sinha, member of Lok Sabha from Ghazipur and minister of communication (independent charge) and minister of state for railways in the union government. A 51-km long Mau Tarighat railway line project costing Rs1,766 crore was kicked off by PM Modi in November 2016. The project which will be completed in next six years would be a boon for the region as it would open fresh business opportunities. 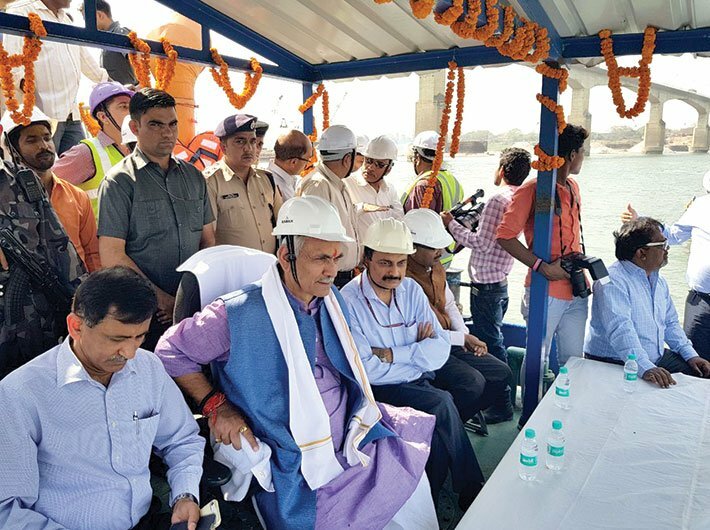 It will provide an alternative, shorter, convenient and better transport infrastructure to the area separated by the Ganga so as to remove the transport difficulties and boost socio-economic development. The catchment area of the project line will serve passenger requirement and will facilitate the people of the area for travelling to different parts of the country. This line will be an alternative route for trains passing from Howrah to New Delhi and back. Construction of this line will provide a link to the Allahabad-Patna double line electrified section. It will also decongest the Allahabad-Mugalsarai-Patna route, particularly around Mugalsarai yard. The new railway line will connect Mau, Barhua, Godam, Mardah, Bigon, Jangipur, Ghazipur city and Tarighat Another railway-road bridge is being built at a cost of Rs 388 crore. Some superfast trains have connected Ghazipur to Kolkata, Delhi, Mumbai, Lucknow, Varanasi, Patna, Guwahati, Agra and Kota. “Now we don’t have to go to Varanasi and Mughalsarai to catch trains to big cities. Trains are at our doorstep now. All thanks to Mantriji [Sinha],” said Ramavtar Kushwaha. Doubling and electrification of Allahabad-Chhapra railway lines, Aurihar, Mau and Bhatni railway lines, Aurihar-Jaunpur railways lines have changed communication in these areas. Some Rs 1,100 crore have been spent on Allahabad-Chhapra lines, Rs 1,000 crore have been spent on Aurihar, Mau, and Bhatni railway lines and Rs 600 crore on Aurihar Jaunpur rail lines, according to government estimates. “Today Purvanchal region is availing developments works of worth Rs 29,000 crore,” said a senior railways officer who wished to remain anonymous. Railway stations in the entire eastern UP have been modernised and are equipped with facilities. “It was my dream to serve my people in the best possible manner, so I did my best to give them everything, especially in the field of railways and road connectivity, health and education,” said Sinha. “I feel that Ghazipur is finally getting its dues. We have been able to do all this because of our PM’s vision,” he added. The region is now well connected with comprehensive road networks. The national highway (NH29) that connects Varanasi and Gorakhpur with Assam and Nagaland was in pitiable condition. Within 20 days of the government formation, Rs 74 crore was spent on the repair works. The same highway will soon be a four-lane network with a Rs 3,000 crore budget. A sanction for NH97 has also been approved for connecting Ghazipur with Jamania and Saiyad Raja through a four-lane road network. The NH19 connecting Ghazipur and Hazipur has been sanctioned Rs 44 crore. “We now have many national highways which will connect Ghazipur to the rest of the country,” said Ramesh Rajbhar, a Ghazipur resident. “Ghazipur is a perfect example of how good governance matched with honest political will can bring instrumental change. Ghazipur has been connected to major cities now through railways, waterways, highways and i-ways and that too just in less than four years,” said Alok Kumar Rai, professor at the Institute of Management Studies, Banaras Hindu University (BHU). “Ghazipur is now known for development and not for negative attributes like drug trade and crime associated with it for decades,” he added. Over 300 toilets are ready and 150 are under construction at schools and public places in Ghazipur. A total of 26 modern community toilets are coming up, out of which 10 are ready. “All busy areas and Ganga ghats look cleaner now. Newly built toilets in such areas are an added advantage,” said another resident Ramashray Prasad. The region will soon have a mini trauma centre which is in the final stages of competition. One well equipped ambulance with free medicines is available to serve people 24x7. Two more ambulances will be dedicated in a month’s time. A lifeline train had also served in the region for about 20 days. Prioritising health benefits, sanitary pads are being made available to female students in schools and colleges. “We have an equipped ambulance with full pathology services and we will soon have a medical college in this area to serve the people,” Sinha told Governance Now in Ghazipur. Under the Mudra Bank Yojana, Rs 200 crore was loaned to youngsters to promote entrepreneurship skill and employment in the region. About 5,000 women were trained by Google and Tata Group and 300 youngsters were trained by IRCTC. A new passport centre was another important facility provided in the city. “Now people can apply for passport in the district itself,” said Shakeel, another resident. More than 100 battery-driven motor vehicles were distributed among differently abled people and more than 2,000 such people have received free treatment and free medicines. Under the Jan-Dhan Yojana, 5,70,000 new accounts have been opened. There are 1,37,000 beneficiaries under Pradhan Mantri Suraksha Bima Yojana, 40,123 are under Jeevan Jyoti Yojana and 8,751 beneficiaries are under Atal Pension Yojana. Apart from that, more than 100 deep tube-wells, free distribution of seeds and organization of krishi mela at regular intervals are making him a popular figure among farmers as well. Sinha has even voiced concerns about the marginalised Musahar community and argued that they should be included in the scheduled tribes category. As a result, union tribal affairs minister Jual Oram visited Ghazipur and assured the community about their inclusion in the ST category soon. “We have been demanding the status for last 40 years. Finally, we are being heard,” said Yamuna Manjhi of this community.